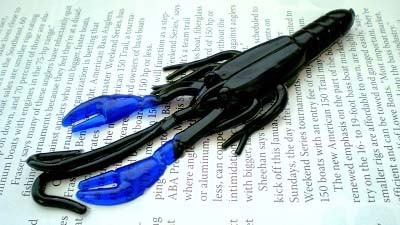 The Crawdad Assassin lure from Bass Assassin covers the grounds for a basic crawdad shaped plastic lure. It has the standard shape and size of a plastic crawdad, with no additional impregnated salts or scents. At first I assumed that the lure would just be like any normal plastic crawdad, however after fishing the Crawdad Assassin for a while, I found that what gave this lure an edge were the extended antennae, claws, and legs. The Crawdad creates noticeable resistance in the water, which translates into large vibrations that will attract any cruising or curious bass. The lure boasts large blue claws as well as long antennae and legs that really create a lot of vibration in the water. The reason I say this is that the lure really provides some resistance on the end of the line compared to other crawdads or plastic lures I have fished. As a point of information, I conducted all of the tests using a BassProShops Carbonlite 6’6’’ medium action spinning rod and a Pflueger President XT Reel spooled with a 30lb braid. One surprising feature of this lure is its durability. I am accustomed to using plastics that are essentially done once an energetic bass strikes; either due to the lure being torn off the hook, or due to the bass tearing it to shreds with its micro teeth. 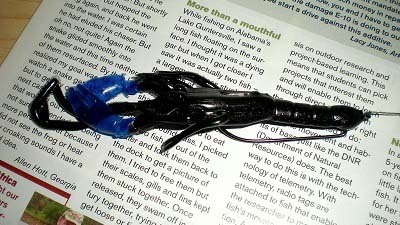 However the materials Bass Assassin used to create the Crawdad Assassin are tougher than most plastic lures and it seems to handle aggressive action very well, and stay on the hook. The reusability combined with the low cost per pack make this lure an instant winner in my book. The actual fishing of the lure is solid. It has a nice weight to it that can generate some distance on casts. The Bass Assassin website recommends using the lure for flipping and pitching which is good advice, especially when using a Texas rigged setup to avoid hooking weeds. I found that Texas rigging it works best and it fits perfectly with a size 4/0 hook. The lure provides a lot of tactile feedback and resistance in the water, and although I’ve already stated it several times, the key is the vibration. I feel this would be an excellent lure for night use because of the water movement it makes and the dark colors offered. It will really stir up the bass if you drag it slowly along the bottom and throw in the occasional twitch, then let it settle before starting again. I am pleased with the lure that Bass Assassin was able to create here. It has incredible durability and a wide variety of colors that can be used in a variety of conditions. I did not get to squeeze any night testing into the lure; however on my next trip it will undoubtedly be brought along. The combination of the large variety of dark colors offered by Bass Assassin and the amount of disturbance and vibration the lure creates, make this lure a key night fishing plastic that should not be overlooked. As a skeptical night fisherman, I often found it hard to believe anything would work at night for bass. Once my friends finally forced me to accompany them on a night fishing trip, I decided the best possible lure would be something with a lot of vibration or movement. I have not used a crawdad assassin yet, but I might try it next time I go night fishing. I have never tried crawdad’s before, they have never seemed to catch my interest. I am more of a worm man but it never hurts to try something new, especially if it will catch me more fish. Bass Assassin also carries glittered crawdad lures too! My favorite one to use is the Black Red Glitter/Red Claw 5″.